God of justice, Father of truth, who guide creation in wisdom and goodness to fulfillment in Christ your Son, open our hearts to the truth of his Gospel, that your peace may rule in our hearts and your justice guide our lives. Through our Lord Jesus Christ, your Son, who lives and reigns with you in the unity of the Holy Spirit, one God, forever and ever. Today is the national celebration of our Nation’s independence. As we celebrate let us remember to pray that God will strengthen and bless America and make our nation a haven of liberty and justice for all — born and unborn. Americans have celebrated the Fourth of July for almost 250 years, with the 241st such celebration just behind us, but the vast majority of Americans have only the vaguest notion of why this holiday matters so much. The Fourth of July does not represent the beginning of the American Republic. Indeed, there was practically no real government at all on July 4, 1776. The men who signed the Declaration of Independence were largely volunteers in a thankless task: express the reason why the thirteen colonies were declaring their separation from Britain. It would be a year and a half after the Declaration of Independence before any real structure to this new polity would be proposed in the Articles of Confederation, but even this document would not be ratified until almost four years after the Declaration of Independence was proclaimed. The Constitution, the current governing document of our republic, was not proposed until 1787, and it would not be ratified by the requisite three-quarters of the states until 1789. The Declaration of Independence was signed when its signers did not know what, if any, form of government the United States of America would create. What the Declaration of Independence did mean was that this new polity was founded upon two vital and closely connected principles. The first principle was that the primary purpose of government is to protect liberty. 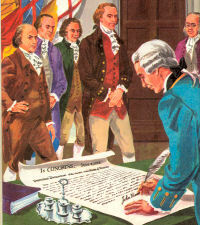 Although later, in the Constitution, a few additional purposes were granted to the new federal government – building postal roads and offices, granting patents and copyrights, coining money, regulating weights and measurements, among a few others – these seem so limited today that we can scarcely relate those limits to the operation of our vast imperial government in Washington. Liberty means much more than the lust for wealth. Indeed, the Founding Fathers would have viewed a macabre fascination with money and goods as evidence of some moral sickness. Many of the Founding Fathers lost their fortunes because of their stand against the Crown and for this embryonic political creation. The perverse belief that the Founding Fathers were driven by economic self-interest was first proposed by Marxists in American academia in the early decades of the twentieth century. Sadly, it has been adopted even by those enemies of Marxism who see life as a crass pursuit of wealth as the highest good. The second principle is that the source of this right to liberty comes from God. Without God, there is no foundation for these rights. If we are simply more intelligent beasts in the jungle, then the idea of transcendent rights has no meaning at all. These wild creatures take what they wish without remorse and conscience. Strength is the only explanation animals need or seek. Many of the Founding Fathers went farther and said that Christianity alone, the religion of forbearance of power except when absolutely necessary, could form the foundation of America and that anything less than that very high standard would be inadequate to preserve liberty. This was something that even the few Deists among that group believed as well. Everyone, especially ultra-orthodox atheists, has religion, but the vast majority of religions find slavery and coercion perfectly proper. Christianity does not. The Founding Fathers had studied history and the failure of nations. They understood the profound religiosity of America, where people, unmolested by the state and out of free choice, embraced a variety of branches of Christianity with reverence and true faith. This was different from Europe, where the land one lived in determined what faith he must practice. God here meant the Christian God, not Allah or Vishnu or Baal or some similar unloving tyrannical cosmic despot. How far have we come from those two great principles in the Declaration of Independence? Government, in the eyes of most Americans, is a tool of their idea of “social justice,” or it is a means to make us prosperous, or it is the vehicle to educate us, or it is meant for any number of other trivial ends that can be accomplished better by free men acting on their own. The Christian God is harassed and driven out of public life, and religiously serious Christians are treated as the problem rather than the solution to problems. The Declaration of Independence is the answer to almost all our political maladies, but we have drifted far from the noble aims of that document. Finding our way back will be a long, painful, and difficult process – though one worth pursuing all the same. The first principle was that the primary purpose of government is to protect liberty. Although later, in the Constitution, a few additional purposes were granted to the new federal government – building postal roads and offices, granting patents and copyrights, coining money, regulating weights and measurements, among a few others – these seem so limited today that we can scarcely relate those limits to the operation of our vast imperial government in Washington. Liberty means much more than the lust for wealth. Indeed, the Founding Fathers would have viewed a macabre fascination with money and goods as evidence of some moral sickness. Many of the Founding Fathers lost their fortunes because of their stand against the Crown and for this embryonic political creation.